ab46182 is not suitable for staining Aquaporin 4 in IHC using paraffin embedded sections but some customers have successfully used the antibody in frozen sections (see submitted Abreviews). Please contact Scientific Support if you need further help. Synthetic peptide conjugated to KLH derived from within residues 50 - 150 of Human Aquaporin 4. 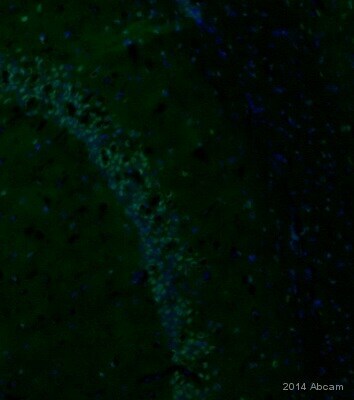 This antibody gave a positive signal in the following Tissue Lysates: Brain (Human), Heart (Human) and Brain (Rat). Our Abpromise guarantee covers the use of ab46182 in the following tested applications. WB Use a concentration of 1 µg/ml. Detects a band of approximately 48 kDa (predicted molecular weight: 35 kDa).Can be blocked with Human Aquaporin 4 peptide (ab46181). Abcam recommends using milk as the blocking agent. 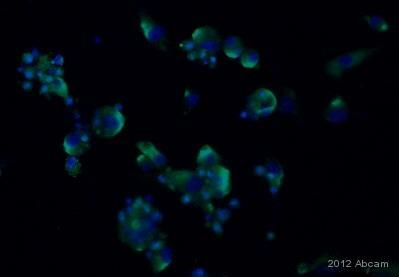 ab46182 staining Aquaporin 4 in mouse RAW 264.7 cells by Immunocytochemistry/ Immunofluorescence. Cells were fixed with paraformaldehyde and blocked with 10% serum for 20 minutes at 24°C. Samples were incubated with primary antibody (1/100 in PBS) for 16 hours at 4°C. 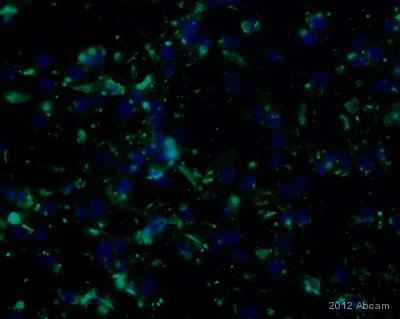 An Alexa Fluor® 488-conjugated goat anti-rabbit polyclonal (1/1000) was used as the secondary antibody. 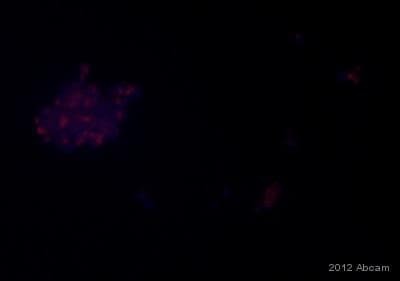 Immunocytochemistry - Anti-Aquaporin 4 antibody (ab46182)This image is courtesy of an anonymous Abreview. 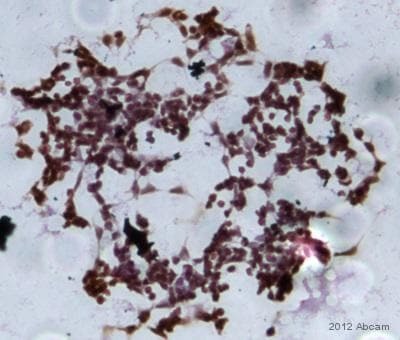 Immunocytocchemical analysis of 33B cells originating from Rat nervous tissue oligodendroglioma, labelling AQP4 with ab46182 diluted 1/100. Cells were PFA fixed. Hematoxyling used to counterstained. Negative control given were ab46182 was not included. Immunohistochemistry free floating - Anti-Aquaporin 4 antibody (ab46182)This image is courtesy of an Abreview submitted by Audrey Lafrenaye. 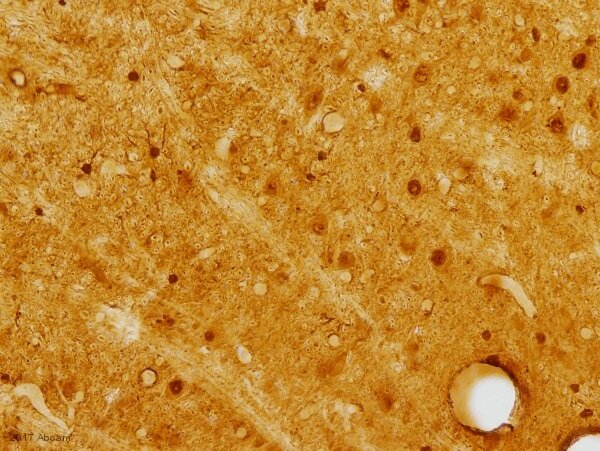 Immunohistochemical analysis of Pig brain tissue labelling Aquaporin 4 with ab46182 at 1/100. Tissue fixed by perfussion, antigen retrieval performed by microwaving in citric acid buffer. DAB staining.